The “casual game” appellation is often tied to games that offer shallow value—simple game mechanics, repetitive play, and copycat styles from other popular titles. Playfirst is determined to break that connotation with games like Chocolatier, which, while still solidly in the “casual game” space, offer a pretty rich gameplay experience. 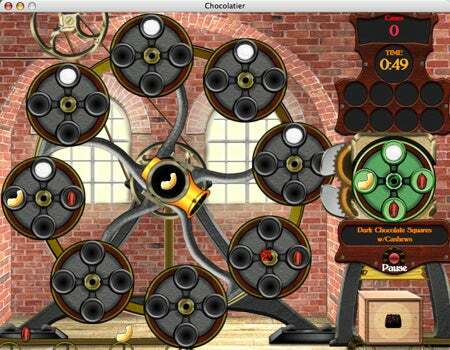 Chocolatier is a strategy game with arcade elements—a business simulation that takes place in the late Victorian era. You’re a young candy maker, tasked by the great chocolate maker Evangeline Baumeister to restore her family’s name. The Baumeister clan has suffered ill fortunate of late after Evangeline left her errant younger sister to run the company. The Baumeister recipes, coveted throughout the candy making world, have been scattered to all four corners of the world, and it’s your job to recover them. To help you pull off this task, Mrs. Baumeister helps seed your fledgling operation and directs you to travel by steamship and rail to exotic locations throughout the Caribbean, Africa, South America, Europe, and Asia as you gather exotic products (cacao beans and Trinidad lemons, for example) at the lowest prices possible. Then you have to return to your factory in San Francisco and put them together, selling them at the highest price possible. That profit margin helps fund further trips, where you’ll interact with characters that have the Baumeister recipes. And they may be willing to barter the recipes back to you if you’re willing to help them. The result is a surprisingly challenging game that features more than 130 quests through 14 cities around the world, as you seek to acquire 64 different recipes. Eventually you’ll need to really put on your tycoon hat, managing confectionary production and multiple factories, making sure that each one has the requisite supply of raw materials to make the fine chocolates that the public wants. Glut the local area with too much of the same product and watch as prices drop (and watch as your profit margins descend). You have to manage relationships with suppliers and retailers, keep your competition hopping and maintain your bank accounts to help restore the Baumeister family’s honor (and bolster your own fortunes). There’s also an arcade game element involved in getting the recipes just right. Each factory contains a machine that produces the chocolates, comprising a rotating housing with slots in it. You need to use your mouse to aim and fire the correct ingredients into the machine in the appropriate proportions. A plain chocolate bar might be one part cacao bean, one part sugar, for example, while a milk chocolate bar requires one part milk as well. When you start making mint chocolate confections or truffles, the recipes get even more elaborate. The more accurately you do this (the machine spins faster and faster as it gets up to production speed), the greater your rate of output. The Sweet Smell of Success Shoot the right ingredients into the machine to make fancy chocolates in the arcade-style element of Chocolatier. Some tycoon-game enthusiasts will find this arcade element in Chocolatier to be off-putting—this certainly isn’t consistent with other business-simulation games, but it does break up the gameplay a little bit, and it offers you something different. It’s also quite whimsical, and helps to add a little Charlie and the Chocolate Factory element to the game that I quite enjoyed. While solidly 2-D, Chocolatier doesn’t skimp on graphics or sound. They help set the game solidly in its Victorian era surroundings and demonstrate top-notch production quality. In addition to the Story mode I’ve just described, there’s a Freeplay mode that lets you set your own company goals. This “sandbox”-style of gameplay will be better for players who may be overwhelmed by the more rigid production and travel itinerary the Story mode offers. When you first start to play, Evangeline will walk you through a tutorial mode that will help you understand the basic gameplay mechanics of Chocolatier. After that, you’ll go off and running pretty quickly. Options in the game are simple and allow you to adjust sound effect, ambient sound, and music volume. You can also mute audio all together (just the thing for cube farm slackers who want to play during work hours) and a full screen toggle that will let you play in windowed mode (better for LCD display-using folks who don’t want the game to scale to an ugly resolution; also better for multitaskers who want to play Chocolatier in-between answering e-mail and surfing the Internet). Chocolatier will automatically save progress in between turns, so if you need to exit to get work done or because your commute is over, you don’t have to worry about losing your progress. My one regret here is that there’s no free online version, like Playfirst offers for Windows users. Chocolatier is a delightfully challenging business tycoon game with some sweet twists and turns. Definitely check this game out, and try the demo.